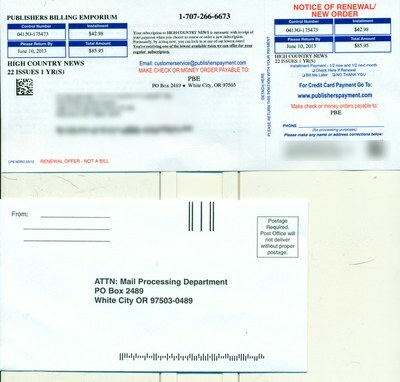 High Country News subscribers should be aware that an Oregon company is using the High Country News brand and has mailed unauthorized solicitations for High Country News subscriptions and renewals. Please note: THESE ARE NOT AUTHENTIC SOLICITATIONS FROM HIGH COUNTRY NEWS. Since High Country News will not honor any subscriptions from Publishers Billing Emporium (read more below), they have issued a postcard (click here to see an image) to some of the subscribers we know have received and responded to their unauthorized solicitation. 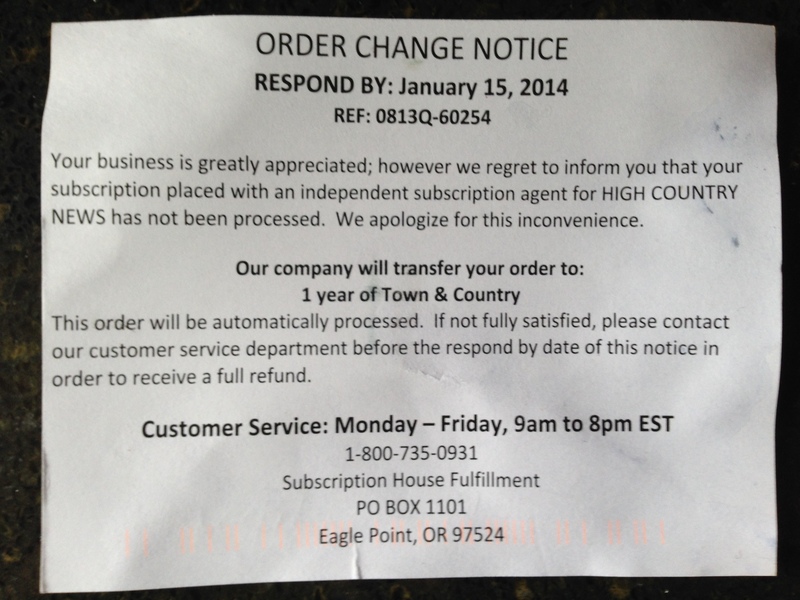 The postcard informs the subscriber that the HCN subscription will not be fulfilled, and that another title will be substituted. This message also contains an offer of refund and an 800 number. We advise any HCN subscriber who has been taken in by this organization to call this phone number and demand a refund. We encourage anyone who receives this latest renewal to notify us (call us, toll-free, at 800-905-1155 or contact us through our feedback form), and then file a complaint with the Oregon Attorney General. The company name being used on these solicitations is Publishers Billing Emporium of White City, Oregon. The solicitation we have seen offers a renewal service for $85.95 and includes some small print on the back. Since this company is not authorized to serve as an agent of High Country News, we recommend you do not respond to these solicitations. We will NOT honor any subscriptions they forward to us. High Country News does not engage other organizations to solicit subscriptions or renewals (with one minor exception that only affects libraries). For renewal emails for our regular subscribers, we will contact you directly through email or USPS postal mail. And we never use telemarketers to offer subscriptions. If you ever have a question about solicitation or renewal notices using the High Country News name, please don't hesitate to call us, toll-free, at 800-905-1155 or contact us through our feedback form. File a complaint with the Oregon Department of Justice, and/or your own state's Attorney General.